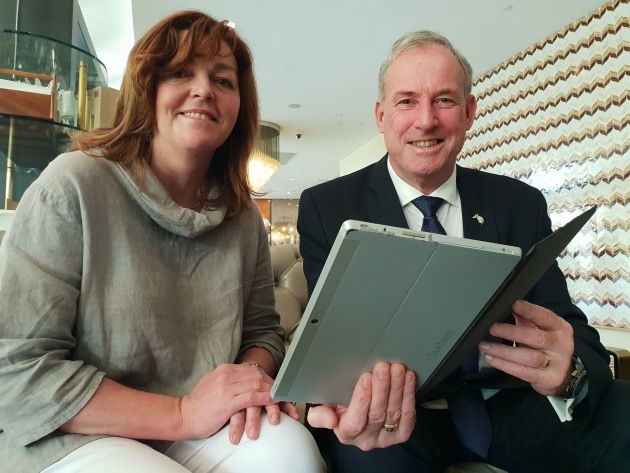 SIA CEO Jane Lovell and Assistant Minister for Agriculture and Water Resources Richard Colbeck. AUSTRALIA'S Commonwealth-managed fisheries have been given a tick of sustainability with no fisheries subject to overfishing for the fifth consecutive year, according to the “Fisheries status reports 2018” recently released by the Australian Bureau of Agricultural and Resources Economics. "This is great news," Seafood Industry Australia CEO Jane Lovell said. "Australia’s professional fishers care about the marine environment and we understand the need to protect and ensure the long-term sustainability of fish stocks. Today's ABARES release echos just that." “This is no accident - it’s the result of careful, science-based fisheries management and co-operation between the Australian Fisheries Management Authority and the commercial fishing industry," Assistant Minister for Agriculture and Water Resources Richard Colbeck said. “It means consumers can be confident their delicious Australian seafood is being sourced from well-managed and sustainable fisheries." "There is more fantastic news today that the bigeye tuna and swordfish in the Eastern Tuna and Billfish Fishery are now classified as sustainably fished," Ms Lovell said. "We acknowledge that internationally there are some fisheries which are not as well managed as ours, but Australia’s professional fishers should not be penalised for international issues, or painted with the same brush, when our local stocks are so well managed. "Significant contributing factors to these mental health issues are the ongoing attacks on and continued threats to resource access. Enough is enough, these attacks need to stop and our fishers need to be allowed to focus on the future of their sustainable businesses. "Australia's commercial fisheries generate billions of dollars for our economy and for our regional communities. We all know Australians love to eat Australian seafood, and Australian's can be confident their Aussie seafood is exceptionally managed. “As fishers, our priority is the ocean. We advocate the health, sustainability and future of our ocean. It’s our livelihood and the future livelihood of generations to come.